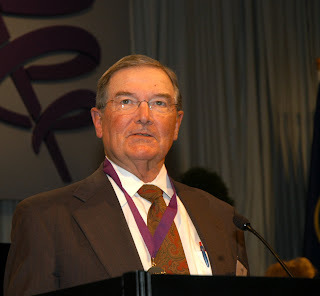 (ORLANDO) -- Calling him "one of the foremost leaders in the field of anesthesiology, ... a gifted educator and a champion of organized medicine," the American Medical Association today bestowed one of its highest honors on a long-time Texas anesthesiologist. James Arens, MD, received the 2008 AMA Distinguished Service Award for his his work to "dramatically reduce anesthesia-related mortality" and for his legacy as an educator. Hundreds of Texas anesthesiologists studied at his side. "Mentoring is one of the most important and satisfying rewards in life," Dr. Arens told the AMA House of Delegates. "Young physicians, residents, and medical students in the audience: Find a mentor and a role model; it is the most important choice you can make to be a success." Before his retirement earlier this year, Dr. Arens served for 42 years as a professor and chairman of anesthesiology at five premier medical schools, including The University of Texas Medical Branch at Galveston, the UT M.D. Anderson Cancer Center, and the UT-Houston College of Medicine. He served as president of the American Society of Anesthesiologists and of the American Board of Anesthesiology. 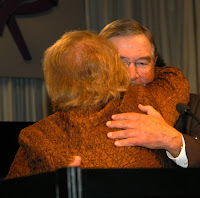 "It is an honor to be a member of AMA, and even a greater honor to have been a physician," he said after accepting the award from AMA President Nancy Nielsen, MD. "A mentor and role model for many physicians, Dr. Arens' services have exemplified the best in medical education," Dr. Nielsen said. The AMA Board of Trustees gives the Distinguished Service Award to an AMA member "for meritorious service in the science and art of medicine."